Dr. Rhoda Narins specializes in tumescent liposuction in her New York City practice. It's important to understand the advantages of having the procedure performed without general anesthesia. 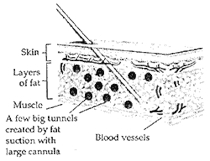 Fat is suctioned through a stainless steel tube about 1/4 inch in diameter or larger. Fatty tissue is infiltrated with large volumes of dilute local anesthesia. 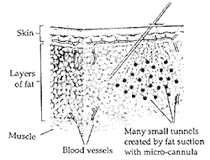 Tissue becomes swollen and firm, allowing more accurate extraction of fat. The special anesthetic solution causes vasoconstriction (temporary shrinkage) of blood vessels, so there is minimal bleeding and virtually no post-op pain. Tiny cannulas or tubes are used and recovery is rapid. Patients can return to non-jarring exercise immediately and go about their business in 1-3 days! During surgery Patient is usually jostled about due to usage of larger suction instruments, and need to move unconscious patient during surgery. Patient is comfortable and awake, usually conversing with the doctor and nurses; use of specially designed small cannula permits a more gentle surgery with, smaller incisions. Patient can easily move into the exact position necessary for the maximum result. Cosmetic results May produce dimples if fat is removed too close to skin. Swelling and firmness of fatty tissues minimizes the risk of post-operative irregularities of the skin as does the use of smaller cannulas. "Liposculpture." Blood loss Potentially serious blood loss. Virtually no blood loss. Blood loss is minimized due to vasoconstriction of blood vessels through the use of epinephrine in local anesthesia; less than 1 tablespoon of blood loss for every liter of fat removed. Bruising Usually significant, lasting for 3 to 6 weeks. Swelling and firmness of fatty tissues permits removal of fat with minimal bruising which lasts only 7 to 14 days. Post-operative soreness Anesthetic effects of general anesthesia wear off in minutes after surgery. There may be significant discomfort and pain requiring narcotic analgesics. Local anesthesia does not wear off for 12-30 hours; thereafter, many of our patients describe their soreness as being similar to what they feel the day after having exercised very vigorously. Side effects/Post-op Often patients experience nausea, drowsiness, headaches, vomiting which may persist for days. Virtually no pain or discomfort. Localized numbness for many hours. Elastic support garment Usually required for 4-6 weeks. Required for 1-3 weeks, with brief removal on a daily basis for showering. Medications Pain Medication Needed Plain or extra-strength Tylenol sufficient but not usually needed. Infection Increased risk of infection Lidocaine & bicarbonate chloride both reportedly decrease bacterial germs and I have never seen an infection. Safety Decreased safety Minimal chance of pulmonary embolus as patient is awake and moving. In addition to liposuction surgery, women and men from New York City visit dermatologic cosmetic surgeon Dr. Rhoda Narins for wrinkle treatments and laser skin treatments. Call (212) 288-9910 (Manhattan) or (914) 684-1000 (White Plains) to schedule an appointment and learn more.